We previously reported Zara's further forays into the homewares market, and can now announce that the first UK Zara Home standalone store has launched at 129-131 Regent Street, London. 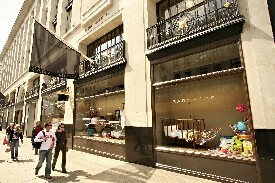 Zara's parent company Inditex describes: "the ground floor features the main Zara Home collections for this Spring-Summer 2006, as well as decorative items for the home, cosmetics and lingerie. The first floor houses crockery, household items and other two collections for this season, the Ethnic and Chic collections. The basement contains table linen, bed linen and towels in fifteen different colours, and the children’s section, with a wide range of textile products and accessories for the little ones". I'm looking forward to a visit! accessories for the little ones". Some time ago, I did need to buy a good house for my corporation but I didn't earn enough money and could not order something. Thank goodness my father adviced to try to take the loan at reliable creditors. Therefore, I acted that and was satisfied with my college loan. The business loans seem to be important for people, which would like to organize their organization. By the way, that is not very hard to receive a student loan.